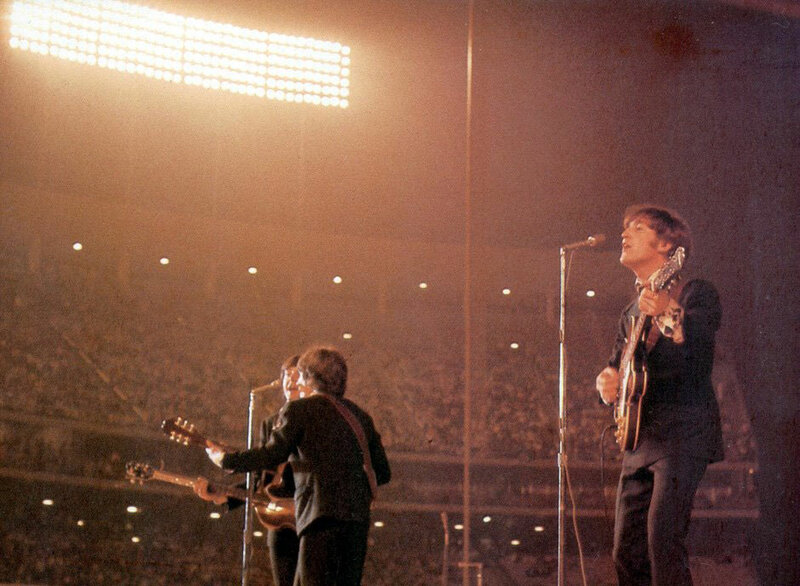 But there were four other groups on the bill that night in the shiny, 4-year-old stadium, leased to the Beatles while the Dodgers were away in San Francisco, and each has a fascinating story. 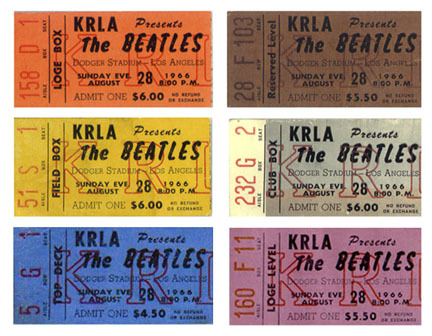 Tickets for the package show ranged from $3 to $6.50 and guaranteed two hours of professional entertainment (future “Newlywed Game” host Bob Eubanks was both promoter and emcee, telling the L.A. Times in 2011 that he paid the Beatles organization $120,000 for the boys’ appearance) as well as all the attendant Beatlemania the crowd of “mostly white teenage girls” (Ebony) could handle. And with 45,000 people in the stands, that was a lot. You can hear a foreshadowing of the easy confidence of “Sunny” in the first 16 measures. By the time Hebb opened for the Beatles in 1966, “Sunny” was already charting higher than anything the Liverpool lads had in current release. “Sunny” would reach Number Two that summer in Billboard rankings, right after the Lovin’ Spoonful’s “Summer in the City.” And even though the Beatles’ “Revolver” had just been released on August 5, not only did the group play no songs from that album on the ’66 tour but only “Yellow Submarine” cracked the top ten before September. This made Hebb the evening’s reigning Billboard star, as the Remains were only regionally famous in New England and the Ronettes hadn’t released anything in more than a year. After Hebb came the Cyrkle, an American group from Pennsylvania also managed by Brian Epstein. The Cyrkle is known for “Red Rubber Ball,” which was co-written by Paul Simon and Bruce Woodley of the Seekers (whose group would cover it in a more saccharine fashion, if possible). Now that you know its authorship, though, don’t you think “Of COURSE it was co-written by Paul Simon”? If the Cyrkle (John Lennon suggested the spelling) seems disposable in the manner of many of the group’s bubblegum pop contemporaries, consider this account of a group of Cyrkle impersonatyrs determined to see the Beatles on the Washington, D.C. leg of the tour. The final group before the Beatles was the Ronettes. 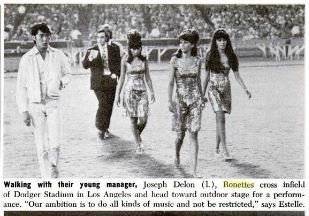 The Ronettes had not had a hit in a year but the three young women from Spanish Harlem were always a big draw live. They’d even palled around with the Beatles on previous tours. In fact, Ronnie Spector was so tight with John Lennon that her famously-controlling boyfriend, Phil Spector, forbade her to go on the tour. So the three women who took the stage that night were Estelle Bennett (Ronnie Spector’s older sister), cousin Nedra Talley (who sang lead in Ronnie’s absence), and their cousin Elaine Mayes. It’s easy to see how this music didn’t fit in with the rest of the bill, but also how exciting this group was. Imagine if they’d teamed up with The Remains full time, rather than just singing backup for the band on this tour! 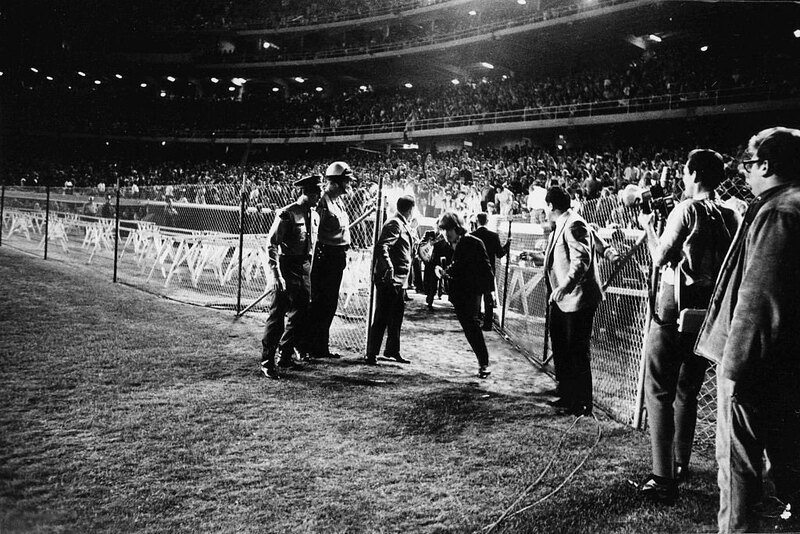 Finally the Beatles arrived, strolling across the field, instruments in hand, from the Dodger dugout, where a big party was going on. They took the stage at 9:33, played 11 songs, and were off the stage 27 minutes later. They’d been in and out of Los Angeles since the previous Thursday, having established a rental mansion on Curson Terrace in Beverly Hills as their western home base, hosting visitors like Brian and Carl Wilson of the Beach Boys and David Crosby. From there they would fly back and forth from shows in Seattle (August 25) and San Francisco (August 29, their last paid performance). The Beatles were also feted at a Capitol Records party at which they met Jimmy Stewart and Groucho Marx. I could not find pictures of this. The 11 songs the Beatles played were “Rock And Roll Music,” “She’s A Woman,” “If I Needed Someone” (George’s only lead vocal), “”Day Tripper,” “Baby’s in Black,” “I Feel Fine,” “Yesterday,” “I Wanna Be Your Man” (Ringo’s sole lead vocal, even though “Yellow Submarine” was currently in the Top Ten), “Nowhere Man,” “Paperback Writer,” and “Long Tall Sally.” Then they were off. But that doesn’t mean the Beatles left the building. After two separate attempts to leave by limousine and one by ambulance, the Beatles finally made it out of Chavez Ravine in an armored car. There was even a point that the group thought they’d have to stay in the dugout overnight, as the crowd just kept coming. We were driven to the stadium in an armored car that was parked immediately behind the stage. At this late point in the tour I suspect that the fans’ grapevine had circulated full detail of the boys’ act, giving everyone prior warning of the songs that would end the set. Even before the group started Little Richard’s Long Tall Sally, hundreds of fans invaded the field and surrounded our getaway car. By the time The Beatles left the stage and we were ready to pull away, many hundreds if not thousands more had positioned themselves across our path. Our driver yelled: ‘Hold very tight, folks!’ Then he slammed his gears into reverse and we sped backwards across the field at breakneck speed. Panic-stricken fans flung themselves out of our way. I was amazed that we didn’t smash into anyone. The trick failed to clear a path for our escape and the driver gave up. At high speed he headed for a dugout at the far side of the field and we hurriedly raced underground out of sight of the noisy hordes of fans. For two hours we were imprisoned in a team dressing room for our own safety while extra cops came in to start clearing the hysterically boisterous crowd. The getaway car we hoped to use was severely damaged and put out of action. Two girls even ran off with the ignition key as a souvenir! All four boys were on the point of despair and we were discussing the possibility that our party might have to stay cooped up at the stadium overnight. Ringo broke the ensuing silence by saying in a small voice: ‘Can I please go home to my mummy now, please can I?’ Two further unsuccessful attempts were made to get us out using decoy limousines and the third try was equally disastrous. We were put into an ambulance that managed to crash into a heap of broken fencing, after which it couldn’t be driven any further. Extra squads of police from the sheriff’s department eventually escorted us away to safety in an armoured car. Silently to ourselves we repeated Ringo’s heartfelt plea. We wanted to go home now. Please, could we? They finally made it out, slept in Beverly Hills, and the next afternoon flew to San Francisco’s Candlestick Park for the final show on the tour. 25,000 people showed up and the promoter lost money. The Beatles brought cameras onstage with them to commemorate the event, which they’d already decided (John with fervor, Paul with reluctance) would be their last concert. An era’s telling epitaph he must not have known he was giving.